During the SID Display Week in Vancouver BC, we got our hands on one of the new e-readers that Pocketbook announced a few weeks ago. The Pocketbook Touch Lux is the new kid on the block, and we go hands-on to check out what this device brings to the table. 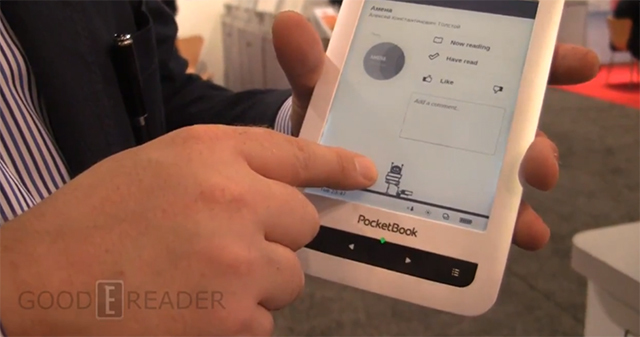 The Pocketbook Touch Lux features the same HD E Ink Pearl display found on the Kindle Paperwhite and Kobo Glo. The exact resolution is 1024×758 and has a front-lit display, which is optimal for reading in the dark. It also has 256 MB of RAM, 4 GB of internal memory, and a SD card support for up to 32 GB of memory. Battery life should be good up to 7,000 page turns. It also has an audio jack so you can listen to audiobooks and music. Sometimes Pocketbook e-Readers feel particularly slow. I have a feeling that most of the internal components are selected from Ricks Restorations bone yard. If you have ever seen the show, it features a slew of crazy characters in Las Vegas that buy and repair vintage items and make them as good as new. Regular viewers of the show are familiar with his bone yard, where rusted items go to die and are cannibalized for parts for existing projects. It feels like Pocketbook paid a visit to said bone yard and randomly selected old computers and beat up monitors and threw them into the Lux. Still, there are some cool features found on this e-reader. Pocketbook borrowed a page out of Kobo’s playbook by adopting its own statistical ebook menu. It shows you how many books or pages you have turned. You can also share some of your reading habits with your friends via Facebook. It’s a great ebook reader. It has text to speech, mp3 support, good quality display…it’s cool and it works very well, you fag face.